One Fish, Two Fish, Red Fish, Blue Fish is a classic Dr. Seuss book that has remained popular for generations. 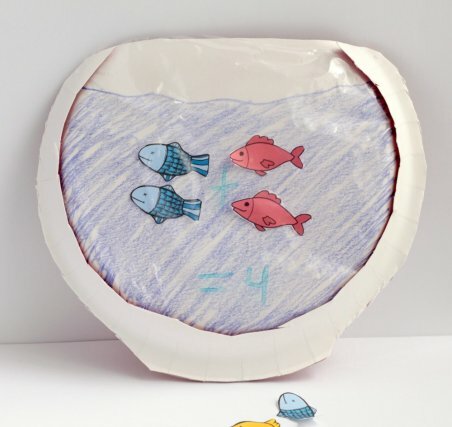 In celebration of Dr. Seuss Day on March 2nd, make this adorable fishbowl craft that is as educational as it is adorable. 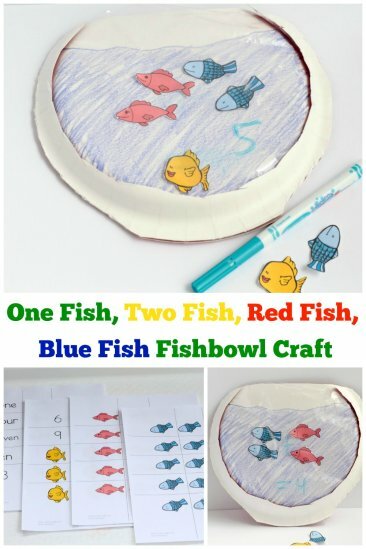 Print out your printables and cut out the fish before starting this craft. 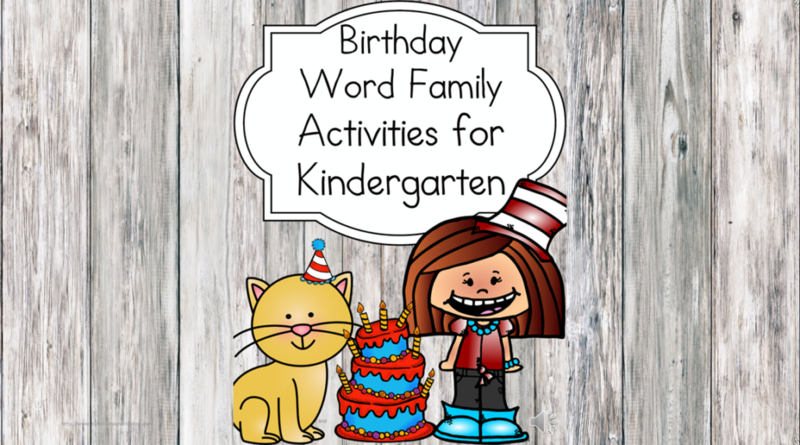 The printable set is designed to help little ones learn number recognition, recognize that words and number symbols can mean the same number, equivalency between numbers, basic counting skills, basic addition and subtraction, patterning, and most other skills that kids need before moving on to first grade. We chose to use our printable set for counting and addition, but there are so many more things you can do with it. Lay your two paper plate on top of each other. Turn the plates over. Draw a fishbowl shape around the edges. Cut out the fishbowl shape from both plates at once. Cut out the center of the top plate. Color the back of the bottom plate with blue crayon to make the water for the fishbowl. Cut open the plastic bag. 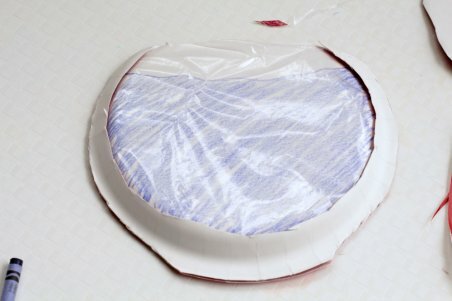 Lay the plastic bag over the paper plate with no center, top side up. Make sure the plastic has enough “give” to touch the table. Glue the plastic to the plate. Wait for the glue to dry (you can also use hot glue for a faster dry-time). Cut the excess plastic away from the paper plate. Sandwich the two paper plates again, making a front and back for your fishbowl. Glue the two plates together, but leave the top open. This is where the kids will add their fish. Slip the fish in between the plastic layer and the paper layer. Write on the surface of the plastic with a dry erase marker. 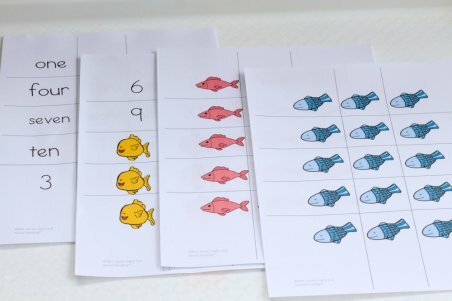 Use the fish to complete simple counting, addition, subtraction, and patterning problems. Let the kids write the answer on the bowl with the dry erase marker. You can also play a game with this. You can put numbers and fish in a bag. Choose 2 things from the bag. If your choices say “two blue fish”, then put two blue fish in the bowl. The child can then write the number two, or spell two. 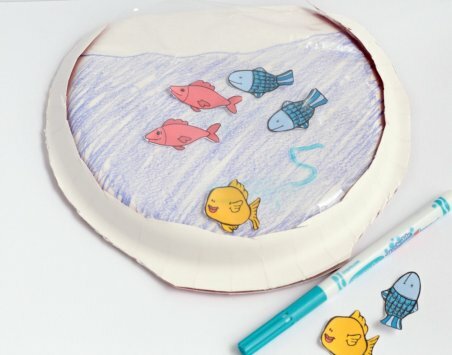 Free Printable Fish to go along with this craft…to get your free printable fish and numbers to go along with this craft/game idea, enter your email into the form below and you will be added to our mailing list. If you have any trouble with your download, please email me at [email protected] Enjoy! If you liked this post, you will also like….